Service providers have their own IPv6 address space. Using ULA is counterproductive. Residential customers don’t need Provider Independent (PI) space or Unique Local Addresses (ULA). Getting something between /64 and /48 delegated to their CPE router via DHCPv6 is more than good enough. Large enterprises should get their own PI IPv6 address space. If they implement Internet access through a central site or through proxy servers (per-site proxy or a central proxy), they could easily use their PI space throughout the network. The challenges start when an organization with PI space wants to implement local (per-site) Internet connectivity – they have to ensure that the ISP providing connectivity to a remote site advertises the site’s PI prefix to the Internet. Get a PA prefix from the ISP, configure IPv6 source address selection on all hosts on the remote site, and pray that it works for every possible operating system. Good luck with that. 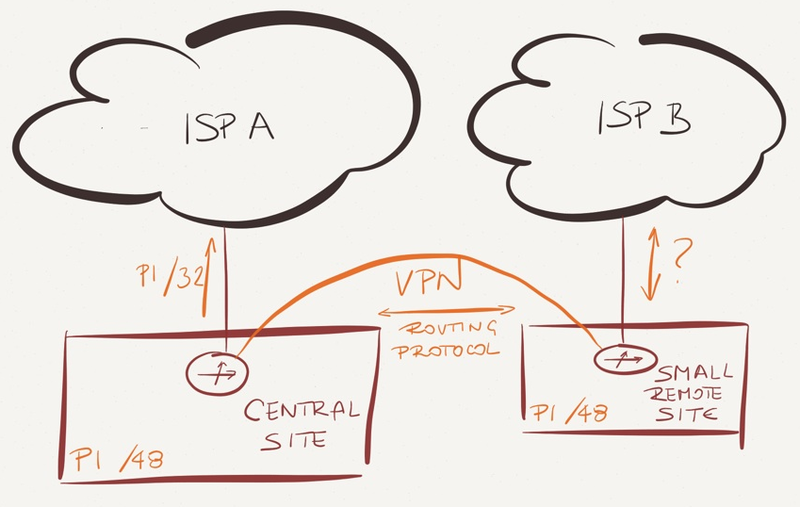 Use ULA (ULA-versus-GUA source IPv6 address selection policy usually works). 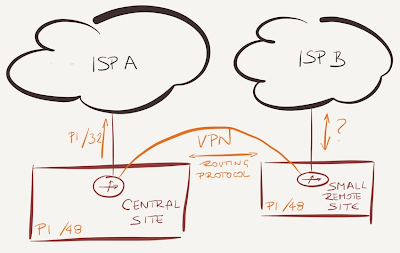 Smaller companies with internal servers and cheap Internet connectivity using PA address space should either migrate their servers to the cloud or use ULA for internal communication. They could also believe that the IPv6 renumbering magic works … and a consultant or two will be paid quite handsomely when they have to switch ISPs and change all firewall rules, packet filters, and who knows how many server configuration files. Check out my IPv6 webinars page. You can buy all of them in a bundle or get them with a yearly subscription. I’m also available for short consulting engagements. Thanks again for this instructive article. It brought me some side thoughts on the recent trends in networking. I used to be a network engineer. I haven't worked in the field for a few years (I now work in security), but I am trying to maintain some knowledge reading articles all around, like the great ones you regularly provide. So maybe my points are biased by my lack of skills. However, from my perspective and with some hindsight, I am stunned by the complexity brought by virtualization and, mostly, IPv6. Yes, all that is extrimely powerful and flexible. But did we really need that? Will the administrators really understand the stuff? I am myself having hard times to catch up and I am often getting lost in all this mess. I see daily configuration errors and misunderstanding on much more basic and old concepts... I mean simple IPv4 subnetting, NAT, routing, etc. So I am really doubting more and more on the chances of IPv6 in adoption, reliability and security in real world implementations. We are far from the sane "keep it simple" principle, often praised to achieve good design... As a security guy, I am really scared. Can you give any free advice on where a large multinational company should get its PI range? Currently it doesn't seem like anyone plans to implement any region-based address filters (they wouldn't work anyway), so you could get a large allocation from RIPE and be done with it. You MIGHT want to get smaller allocations from other RIRs just to be on the safe side. Thanks! We have a long way to go before pulling the trigger on this, but I'm trying to get my mind wrapped around it. We'll bring someone like you (maybe you!) inside to look at the details before making such a huge decision, I'm sure. Aww, c'mon Ivan -- everyone knows the answer is IPv6 site-local addresses. - for native v6, you're still stuck in the boat as most enterprises won't bother figuring out what ULA is & applying for it until it's far too late. However, at least with the plethora of unique IPv6 addresses you can do stateless 1:1 NAT on one of the gateways & not worry about it too much.